Being a designer. Something that many people out there dream of. At least I did when I was a kid. I remember sitting in my high school in the foothills of Adelaide, Australia making my first scribbles and daydreaming about shoe design and travelling to faraway places. And I made my way. Today I am heading up the adidas Running design team, located in a small Bavarian town about 15,000km away from Adelaide. And I enjoy every day. So I am asking you now – do you have what it takes? It sounds obvious but it is the simple truth. It all actually begins with passion. In my case it is the passion for sport and a love for footwear. But it can also be a passion for cars, furniture, watches, clothes or whatever you want to design. Without that, I believe it is almost impossible to become a good designer. Believe it or not, you need to have proper skills. 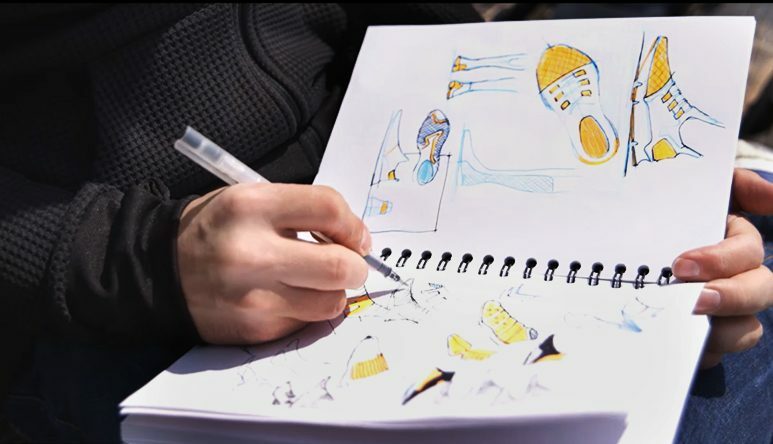 Most footwear designers discover their passion early and move toward a course such as Industrial Design. This course helps develop natural creative talents like drawing and sculpting and turn them into tools for solving complex problems. The course also provides a foundation of methods and skills such as design thinking, human-centred design and design for manufacturing that will add value in any creative organisation. But professional education is only the beginning. 3. A genuine interest in people Design is very much about understanding the consumer and finding out what they value and why. It is about finding meaningful insights that can fuel and drive designs. Here at adidas we place ourselves at the centre where sport, culture and creativity collide and we understand the meaning that sport can have in people´s lives. For example when we designed the Ultra Boost, the key insight we had was around energy. I still love to watch people try Boost on for the first time because their reaction is always amazing. With Ultra Boost, we wanted to build on this feeling that Boost feels alive. We worked hard to make every part work in harmony with each other so that the whole shoe just comes alive with energy. For you that means: if you want to be a designer you need a good portion of empathy! The world never stands still and this is especially true for the world that we live in – the world of design. What was the truth yesterday suddenly isn´t anymore. Things move fast and the world around our consumer is constantly changing. As a designer you need to be willing to always learn, always ask questions, challenge what you know and unleash your natural curiosity. A curiosity to ask ‘why does that shoe look like that?’ Check out this video to see how for example the world of running has changed and what that meant for us as designers. 5. And lastly – good storytelling skills. Design is also about storytelling, about building chapters in a story. Let´s take the Ultra Boost as an example again. It aims to be not just an extension of yourself but also the city you live in. So the launch colour was inspired by the urban cityscape and the night sky as it changes from night to day and day to night when a lot of people are out running. As the year unfolds, the Ultra Boost will follow the moods of the season and so the colours over the summer are bright and filled with energy. As we move toward September, we start to bring more neutral, toned-down colours and let the richness of the textures shine. You get the idea. With every new colourway, there is a story behind it that builds and grows from one to the next. Now let me ask you. Are you a good storyteller? Do you have the passion and the skills that it takes? Are you empathetic and willing to accept and drive change? If so – congratulations, because you are about to make a career in what I think is the best job in the world. Ben, this is a great article that resonates with a lot of the feelings I have towards footwear design. Do you have any advice for students like me who are trying to make our way into the industry? Any tips or suggestions on getting footwear design internships? Probably the most potent application with regard to creating sympathy being a custom will be prototyping. That fulfills other team half-way, may be the 2nd almost all convincing artifact the initial like a narrated movie with the prototype. I recently found a website "Game Plan A"
Great that you're an adidas and a GamePlan A fan! Please use the contact form here on GamePlan A or on our website (www.adidas-group.com) to get in touch with us. I'm afraid, I can't give you an e-mail address of our design teams. The best way to get in touch with us via e-mail is to use our contact form here on GamePlan A: http://www.gameplan-a.com/contact or on our corporate website: http://www.adidas-group.com/en/service/contact/. I am a mold maker Shoes and Sandals. I know somewhat the shoe out sole design. And I am very interested in the design. And one of my goals dimensional design professional shoe. Hi Ben. I am a high school student in Korea, and my goal is to be a designer like you(especially in Adidas!) Would you mind if I ask specific steps of how to be a designer? I hope you send an email to me. Anyway, your article was great, and I was so impressed with it. Thank you! thanks for your comment. So great to read about your passion for design and the 3-Stripes. What are your questions for Ben? I'll try to find out some answers for you. It helped me get back into sneakers and clothing. The first time I saw the nomad silhouette it gave me goose bumps. I cannot believe it had not been sold out, so I purchased a black and red colour way that is my favorite. Not to mention most of my favorite athletes Damian, Harden, as well as my favorite college football team Miami hurricanes. Also my birthday is 3-3-80 so I feel connected to the three stripes. Creative “hustlers” come in all shapes, sizes, and personalities. thanks for sharing your passion for the 3-Stripes! As you're a big sneaker fan I'd like to know if you have any tips on how create a cool outfit with sneakers for the office? Ideas? For me at adidas, it's easy to wear sneakers at work, but not everyone can work in such a cool work environment. Maybe you can help our GamePlan A community members who are working in a more classy environment, too? I think it would be interesting if you guys did snowmobile clothing. A hunting and fishing limited collection with Adidas for fall winter? Motocross? Dirt bike apparel for something different. Maybe you reach another group of potential consumers. The ultimate project that would be my dream would be designing A M3 Adidas BMW.